It’s funny the effect of sequence. 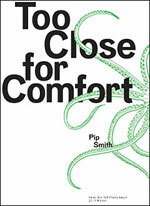 When I picked up Pip Smith’s collection Too Close for Comfort, winner of the 2013 Helen Bell Poetry Award, I wasn’t primed for anything. I had no expectations – neither indulgent, nor prickly. The volume has texture: bundles of thin pages alternating with thick ones, the latter offering various portions of an illustration of the work’s ‘leitmotif’ – the giant squid. The squid, you see, is the creature who will embrace ‘our prawn pink necks’ when we are all at the bottom of a globally warmed ocean (from the collection’s title poem, p. 27). It was when I reached this poem, almost a third of the way through the collection, that I exhaled gratefully, and started to enjoy the less brassy side of the ride of Smith’s poiesis. I reflected that there might be lots of reasons for a publisher, and for the poet herself, to have chosen to open the collection with a number of strident examples. They are topical, indignant, disdainful, cleary parodic, maybe smart-arse … and can feel a little like being splattered with a scorn-sprinkler. They would certainly avoid any pre-emptive labelling of the collection as ‘girly’, ‘touching’, or ‘sensitive’. But gender-strategies aside, I couldn’t – at least in that initial moment of reading – manage to like the atmosphere very much. Hence the question of whether I could stomach coming back for more. But at that precarious point ‘Etymology’ and ‘Now that’s cricket’ arrive as a kind of humorous, cheekier hinge (pp. 22-23) managing to tip Too Close for Comfort into a more promising register – for me at least. From page 27 onwards, Smith’s imagery manages to navigate the knife-edge of the found/ventriloquised/pedestrian and some of that poised/’axe inside us’/arch sweetness for which poetry is the medium. ‘When I was born her hair turned violet. Sometimes you can gauge the mettle of a poet in those modest but deceptive articulations. Here Smith is at her least gimmicky. This content could be found anywhere in the last 300 years and it would work (in so far as poetry works – on us, at us, in us). This is, of course, not the only kind of content to make or value, but this lens can be a revealing one, and ‘Plum Tree’ didn’t seem fazed by its application. So I learnt something about myself in reading this book: that I don’t necessarily need brash and I don’t need withering. But I do need something like Smith’s gob-smackingly gutsy and steady slant on this moment. Australia, now, in some version of its squirming, blasé reluctance, in its not-knowing who or what to be, in its careless nouveau navigation of far too much, and too, little privilege. The second half of this book takes a straight and nimble running leap towards a disciplined fierceness of dissent. Now – admittedly I was eating messy watermelon to the first third, and squeaky frozen mango confections to the other two. This could account for my very different experience of the sections. To corroborate my reading, you could fetch something clement to drink or gnaw, settle in, and let Too Close for Comfort wrap you in its cool, stealth tentacles. Maybe this squid can help us get out of the tight maze our wide, brown body-politic seems to find itself in right now. This entry was posted in BOOK REVIEWS and tagged Antonia Pont, Pip Smith. Bookmark the permalink. Antonia Pont is a Melbourne-based writer of poetry, short stories and theoretical prose. She is Senior Lecturer in Literary Studies and Professional & Creative Writing at Deakin University. She reviews for Cordite, and her work has appeared in Meanjin, TEXT, Rabbit, Visible Ink and Antithesis, among other publications.